Inside a seemingly innocuous building steps away from Tokyo station is the Pasona O2 Indoor Urban Garden. 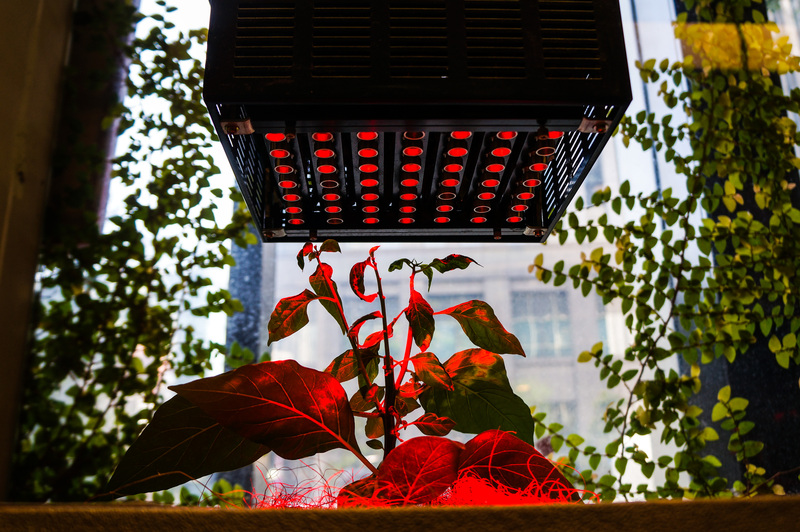 It occupies 10,000 square feet of office space in six different rooms where they exhibit different indoor growing methods for different plants. 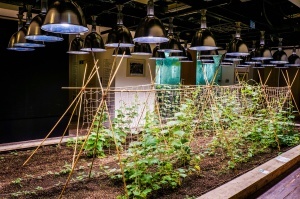 it was designed by a New York design firm, Kono Design, with the purpose of allowing the employees of Pasona, a human resources firm (read: temporary staffing), to grow and pick their own vegetables at work. I first visited the Pasona O2 exhibit in 2010 when it just opened and found it intriguing but didn’t have much context into growing, especially indoors. After living in the countryside for three and a half years and learning much more about the origin of food, how to grow, and a bit of the science behind growing, I decided to revisit the Pasona building. All of the exhibits were basically the same which was good because I wanted to see if my understanding or appreciation changed at all from 2010. After learning much more about growing out here in the countryside, I had mixed feelings about the rice growing exhibit. They had created an indoor rice paddy where they could grow rice in the middle of the main hall. This is also where people can sit, drink coffee, and have informal meetings or do their work. 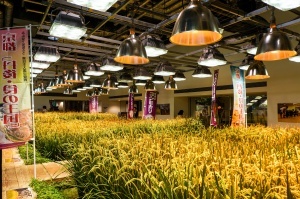 To grow the rice, they used 21 metal halide lamps that were probably 1kW each and supporting fluorescent lights that were probably around 200W each. My rough estimate is probably around 30kW+ of power being consumed for at least 10 hours daily to grow the rice in the paddy. A paddy this size would provide enough rice to feed a family for a year. That’s ~1 MW-hr of power per month, and based on electricity prices at hackerfarm, would be approximately $500 USD per month. If you assume that an average family of 4 consumes two 10 kg bags of rice per month, that means each bag of rice costs at least $250 USD not including the cost to process (thresh, dehusk, and polish) the rice before it becomes the standard white rice you see in stores. In Tokyo, a 10 kg bag of rice costs about $25 USD which is a 10x differential in price. 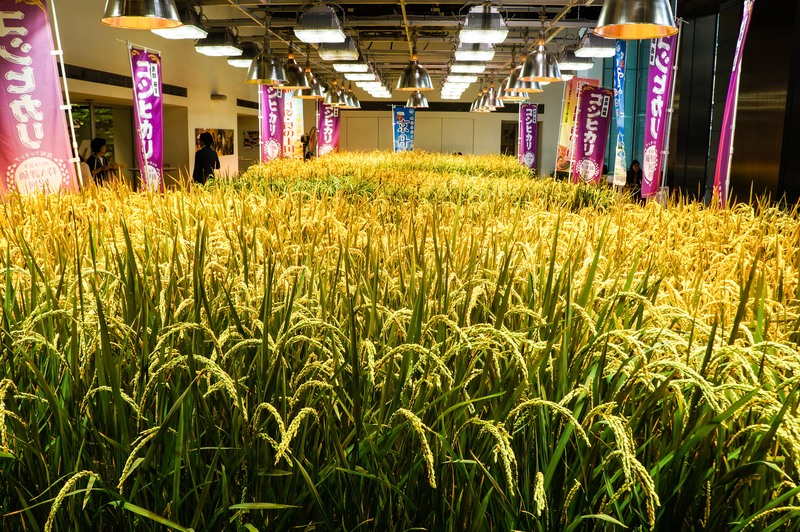 Of course I understand the rice paddy is more of a concept piece designed to elicit conversation and to remind Japanese people in Tokyo about the their rice growing heritage. But I also think it represents how out of touch many Tokyo dwellers are with their traditional agricultural roots and rural rice growing communities. Rather than have people visit beautiful countryside surrounded by nature and seeing the rice paddies in their proper environment, they save busy office workers the trip and present a rice paddy as they would a zoo exhibit with a single exotic animal completely displaced from their natural habitat. This is how a traditional Japanese rice paddy looks like. It’s actually the communal rice paddies near Hackerfarm where we help grow rice with others, both in the area and from Tokyo. 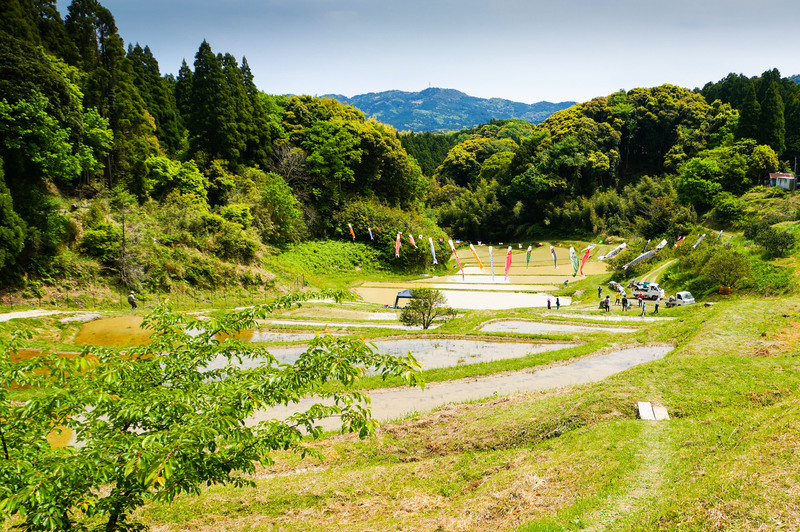 Actually, we just had the Hackerfarm annual rice planting event yesterday at the beautiful rice terraces in Kamanuma. The cost to participate is free and we encourage anybody interested in learning how rice is planted to participate. Each paddy is assigned a group of people and is led by a village elder who has been farming the traditional Japanese way for almost their entire lives. They’re typically over 80 years old and still spry with a sharp sense of humor. They’re also more than happy to teach anyone that wants to learn the Japanese technique of rice farming to pass on the knowledge and culture to younger generations. Luckily, the rice exhibit was the only thing that really made me scratch my head at Pasona. I thought the other exhibits were quite clever in their presentation. 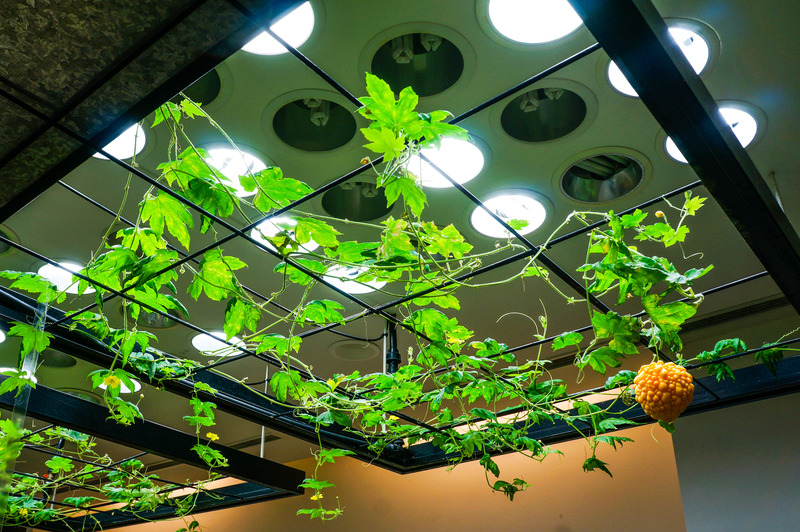 They had hydroponic installations, hanging vines from the ceiling sprouting squash in the middle of a reception area, and tomato trellises fed by fluorescent lighting. 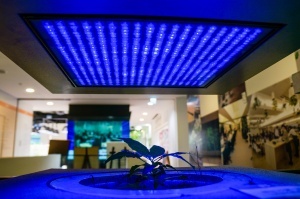 One of my favorites were the exhibits that showed the different effects that colored LEDs have on plants. You can clearly see how blue, red, and green LEDs affect the growing style of the plant as well as how a deficiency of any of the colors will affect it. 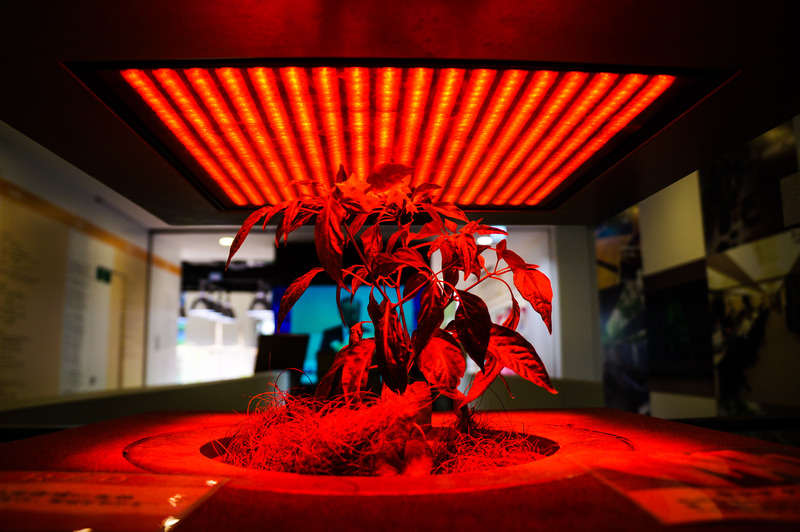 Using LEDs as a as artificial lighting for plants started out as experiments by NASA for growing food on deep space missions in the late 1980s. At the time, it was prohibitively expensive due to the high cost of LEDs. Blue LEDs were still cutting edge technology and of low enough quality and they had to substitute blue fluorescent lighting instead. Today LEDs are considered commodity items with typical red, blue, and green 50mW LEDs going for around $0.01 each. At hackerfarm, we generally buy these LEDs in bags of 1000 pieces. What the Pasona LED displays did so well was visibly demonstrate the effect different colored LEDs have on the same plants. 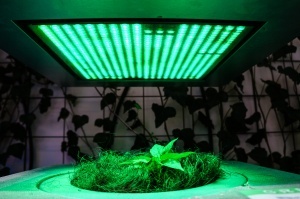 They would grow the same plant under the same conditions but with different colored LED grow lights. For the blue-lit plant, it tended to grow small and bushy, while the red LED-lit plant grew narrow and tall. 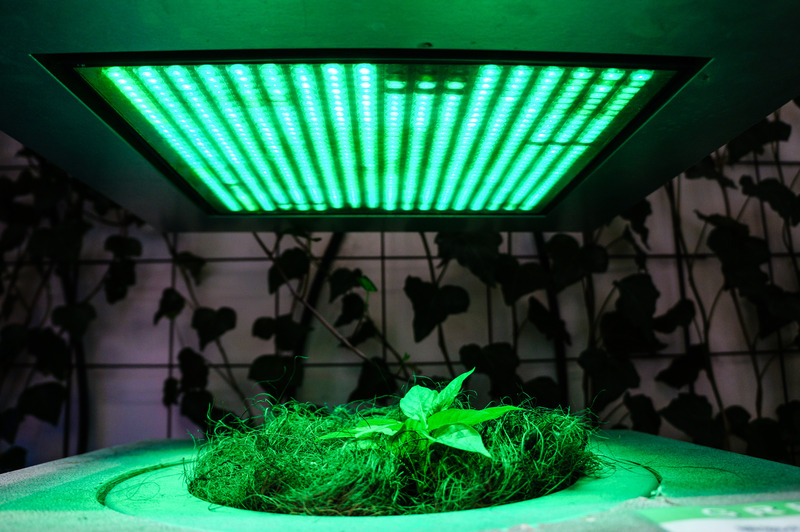 The green-lit plant had stunted growth which makes complete sense because plants reflect most of the green light that falls on to them. That’s why we see most plants as green. They also had an interesting twist. They used laser diodes with the collimating lens removed. 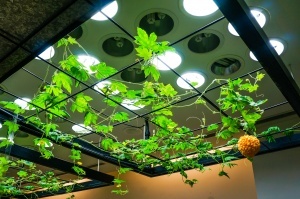 The laser provides a very concentrated red light in a narrow bandwidth to the plant and is strong enough that it can penetrate the top canopy and provide light to leaves on the lower canopies too. Overall, I’d have to say that Pasona’s O2 Indoor Urban Farm did what it was intended to do, which was provoke me to think more about urban gardening and the limitations faced by people that want fresh food in a dense city with little outdoor, sunlit space. I do think in the future we will be testing out indoor lighting and grow lights at hackerfarm. The purpose would mainly be for growing off-season vegetables and fruits and doing indoor growing experiments, especially during the winter. But I can now see that it would be of particular interest to people living in the city that are both nature-starved, and wanting to grow their own food for various reasons. I still cant’ say that I agree with the indoor rice paddy as anything other than a horribly energy inefficient publicity stunt, but at the same time, maybe that’s all that it was meant to be. It at least got me thinking just a little bit deeply about indoor rice growing, its inefficiency, and also made me appreciate how lucky I am to live in an area that is naturally lush with so much greenery and of course many, many rice paddies.